McCree is the only construction firm in the Central Florida area with engineering, architecture and construction under one ownership. This Pure Design-Build infrastructure means you will have a realistic budget that’s far better than just a ballpark budget. Your front-end benefit of a full-service design-build construction team means you’ll better anticipate all of the costs you’ll face to create your new work space. A McCree budget more accurately, yet conservatively, presents the complete costs associated with your proposed budget because it is given by the people who will actually do the future design-build work. Engaging McCree for a feasibility study will provide you with a regulatory review of the property, a preliminary design, preliminary schedule and a preliminary budget. Each of these will allow you to better understand what is involved in completing your project and how much it should cost. From there, you may make the decision before spending a lot of money and time whether the project is best for your organization. Setting an initial budget is a key element of your financial calculations with a direct bearing on a variety of investment opportunities you’re likely assessing. Once you decide to move forward with a construction project, you don’t want overrun surprises that can later crimp or ripple your core operation. That’s no fun for any of us. 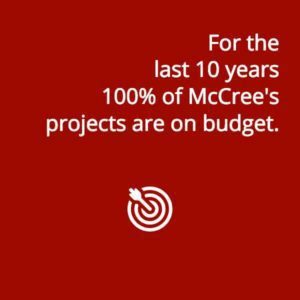 For the last ten years, 100% of McCree’s projects have been on budget. “Designed & Built Right” is a promise because it is our holistic way of caring for our customers’ businesses as well as their construction projects.